Mersina was so cute today. She would bring me her little ladybug backpack with the harness; indicate she wanted the straps placed over her shoulders and the buckle at the front clipped into place. Once that was secured she would hand me the strap and head off to our bedroom where there is a little bookcase in the corner. Along the way she found her hat, put it on, took it off and then put it back on again. She then opened some drawers, rifled through some papers and observed and played with the radiator. All the while I was holding on to the strap. I heard a sssss noise, looked up and M was reading Dear Zoo and was lifting the flap which reveals the snake. I would occasionally speak to Mersina in Greek but hadn’t fully made the transition until her first birthday. We were at a pub off Gloucester Road for Mersina’s birthday – just having a coffee – and we were sitting near a family where the mother spoke French to the two children and English to the rest of the family. 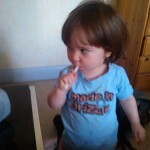 I guess that was the tipping point to the continued intention to do something about raising M as bilingual. I would actually love for her to speak French and Spanish as well but we will have to see about that. 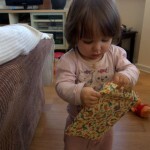 For now she understands a lot of what I say to her in Greek, she knows “pou einai…” (where is…) and various items. She knows good morning and good night etc but since she is not really speaking English yet either I am not quite sure how much she understands. We will see. So far it has been easier than I thought and it makes me want to listen to more Greek music, read Greek and watch more Greek movies. We are a work in progress. Here is an article on the benefits of bilingualism. 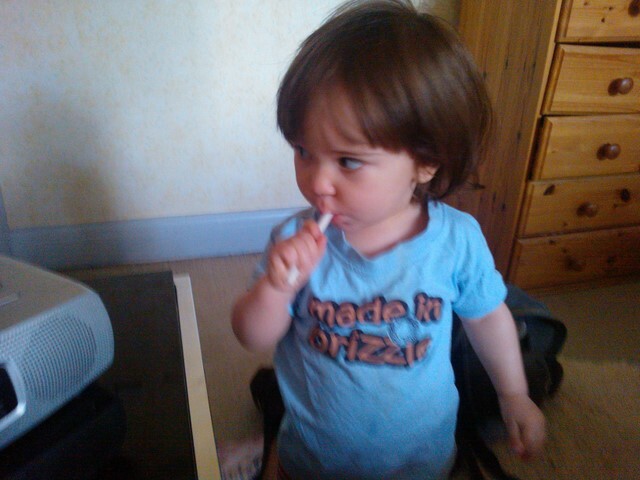 Mersina is no longer a big baby but a little person. Such a tiny little person. We were at the library on the weekend and there was another little girl there with her dad. The other girl was perhaps three or four years old and was chatting away. Little M was little and doesn’t speak or converse yet. She watched the other girl for a little while and then reached down to play with a truck. The girl was playing with and setting up a train track. She started taking it away and M looked on not quite sure what to do. 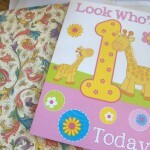 Then the other girl started hopping on a mat with numbers and this made M happy because she knew about running around. She ran and jumped a bit on the mat until the bigger girl went over to a chair which was a children’s chair. 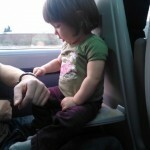 Little M went to the one next to her so she could sit down. She knew what to do with this game and she seemed happy. 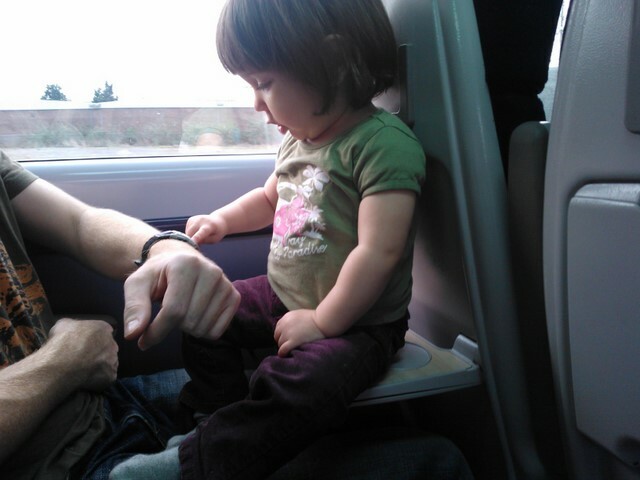 The girl then took away the second chair and little M just stood there looking lost. The girl’s dad told her to put the chair back for M but to no avail. My heart ached for her as she stood there in her dark pink shoes and denim dress that was too big for her. When I was pregnant with her I was mostly worried that I wouldn’t be able to manage her nappies. That was my biggest fear. Now I can’t sleep at night for thinking of how little she is and how she will have so much to deal with. Not knowing what to do is normal and what’s called beginner’s mind. She doesn’t seem to mind but it terrifies me and makes my heart ache. She’s so tiny and pure and I hate the thought that at some point she will lose this. 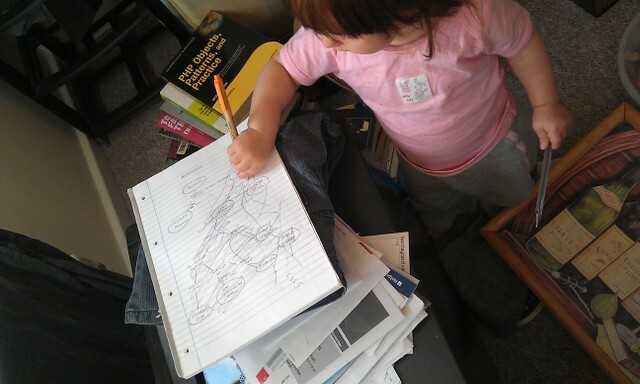 I found Mersina this morning in her godfather’s room attacking his notepad with a pen – on purpose. Up until today, I don’t think she knew that you could do something else with a pen apart from eat it so this was a huge moment. Her contribution is the squiggle on top of the diagram. She has not yet progressed as far as that. This past Sunday, Mersina and I spent Mothers Day with her grandparents at their house. She woke at 0630 and about an hour later we ventured downstairs so she could roam in the living room. Her granddad made me a cup of tea and Mersina explored the bookshelves and the newspapers. Not long afterwards her daddy made an appearance and I went off to have a shower. A long shower. A long shower with no worries about what the baby was up to. I then went down to breakfast which someone else had made, and which Mersina helped stir, and sat down to a table already set. I had orange juice poured for me and honey and sugar already set out on the table to go in the porridge. 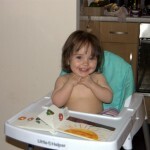 Mersina loved her honey and porridge and had her whole bowl of it. M’s grandmother and her daddy and I went to church and M did lots of running around and playing. A surprising amount, really, for a church service. She was so tired that she fell asleep in her pushchair for over an hour once we got back. I read the newspaper and complained about bits and pieces in the newspaper. We went out for lunch and for a swim where Mersina showed off her underwater swimming skills and her holding on to the side of the pool skills. There was a soft-play area which Mersina loved and kept going back to even though it terrified me. There were lots of little kids in there and most of them seemed to be super-speedy and aggressive boys who charged around and poked at people and threw things. I wanted to grab her and get her out of there a few times but her dad was a little more restrained. Throughout and after lunch she had four bodyguards, effectively, as the grandparents and her dad and I all went in there with her. It was really heartbreaking in a way to see her so defenceless out there in the “real world”. The night before, at dinner, Mersina’s daddy sat next to her and fed her so I had the time to just eat my food and drink my wine before taking her up to bed where she slept in a travel cot and I had the whole bed to myself. A lot of it reads so ordinary but it was anything but. I was with people who were as much family to her as I am. They took care of her and watched her and gave me some time and it was the loveliest Mother’s Day that I could have imagined. 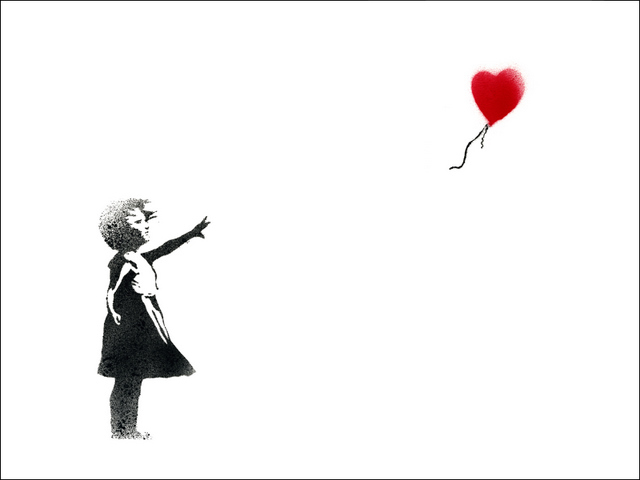 Mersina, via her dad, gave me a Banksy print as a present and it is one I always associate with her and love. A little girl lets go of a heart-shaped balloon as if to say where you go, my heart goes with you. 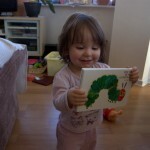 Thank you, cousin Harriet, for the fabulous Hungry Caterpillar book. It is one of Mersina’s favourites. We have some mint growing in a flowerbox on the window sill. When Mersina was a tiny, I would distract her from any falls and scrapes by taking her to the mint and letting her play. She didn’t show any signs of recognising that it smells any different. 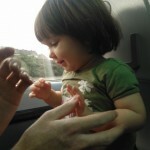 Yesterday I took her to the mint again and touched some and then put my hand to her nose. She seemed to smell it. 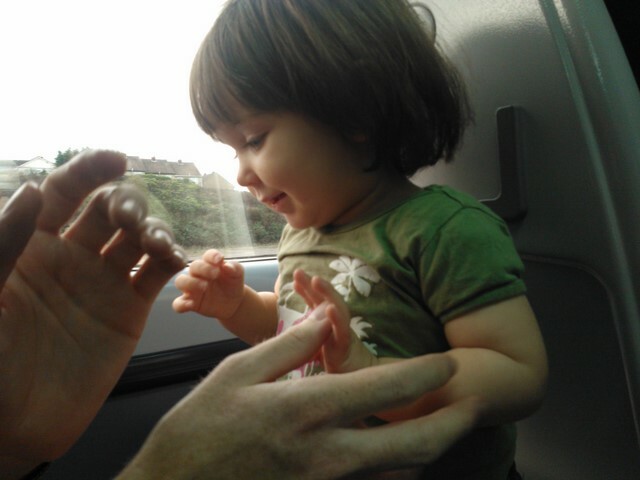 She then touched the mint and put her own hand up to her nose. Your child is learning about numbers all on her own. You can find out how much progress she is making and even help her along. Count them into a box while your child is watching. Take the box out of her sight for a minute. Take one of the items out. Take the two objects out of the box with her. See if she looks for the third. Infants of one and over will generally be surprised not to see the third object, proving that the can count. If she is surprised, try the same trick with four or five objects to find out how far her counting goes. 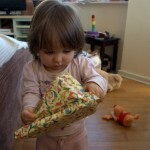 During the year she will probably get better at knowing how many objects were there. I was tagged by Fritha and I did not realise how tough this would be but here goes. 5. Go to their blog and tell them they’ve been tagged! 2 Whenever I really want to buy something I go to a bookstore, walk around and pick out the books I want and then after a while I put them back. 3 I prefer wanting things to having them. 4 I don’t understand why Shawshank Redemption is supposed to be a great movie or novella. 5 One of my eyes is long-sighted and the other is short-sighted but I only wear one contact lens. 6 I think kindness is more important than intelligence. 1 If you could change anything in your past, would you? 2 What is one of your standard meals at home during the week? 3 What was your favourite childhood cartoon? 4 What song reminds you of a happy time? 5 What is your favourite comfort food? 6 What is the nicest smell you can think of? 7 What is your favourite joke? 8 What was the last gig you attended where you sang along with the band? 9 What was the last film that made you laugh a lot? 10 If you had a weekly column in a newspaper, in what newspaper would it be and what would you write about? 11 If you could hypnotise people, what would you help them do?